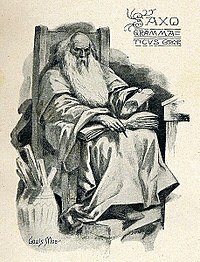 Saxo Grammaticus (c. 1160 – c. 1220), also known as Saxo cognomine Longus, was a Danish historian, theologian and author. He is thought to have been a clerk or secretary to Absalon, Archbishop of Lund, the main advisor to Valdemar I of Denmark. He is the author of the Gesta Danorum, the first full history of Denmark, from which the legend of Amleth would come to inspire the story of Hamlet by Shakespeare. The Jutland Chronicle gives evidence that Saxo was born in Zealand (Danish: Sjælland). It is unlikely he was born before 1150 and it is supposed that his death could have occurred around 1220. His name Saxo was a common name in medieval Denmark. The name Grammaticus ("the learned") was first given to him in the Jutland Chronicle and the Sjælland Chronicle makes reference to Saxo cognomine Longus ("the tall"). He lived in a period of warfare and Danish expansion, led by Archbishop Absalon and the Valdemars. The Danes were also being threatened by the Wends who were making raids across the border and by sea. Valdemar I had also just won a civil war and later Valdemar II led an expedition across the Elbe to invade Holstein. Sven Aggesen, a Danish nobleman and author of a slightly earlier history of Denmark than Saxo's, describes his contemporary, Saxo, as his contubernalis meaning tent-comrade. This gives evidence that Saxo and Sven might have soldiered in the Hird or royal guard since Sven used the word contubernium in reference to them. There is also a Saxo to be found on a list of clergy at Lund, where there was a Sven recorded as Archdeacon. Likewise there is Dean Saxo who died in 1190; however the date does not match what is known about Saxo. Both arguments, for a secular or religious Saxo, would confirm that he was well educated, as clergy he would have received training in Latin and sons of great men were often sent to Paris. Saxo comes from a warrior family and writes that he is himself committed to being a soldier. He tells us that he follows "the ancient right of hereditary service," and that his father and grandfather "were recognized frequenters of your renowned sire's (Valdemar I) war camp." Saxo's education and ability support the idea that he was educated outside Denmark. Some suggest the title "Grammaticus" refers not to his education but rather his elaborate Latin style. We know from his writing that he was in the retinue and received the patronage of Absalon, Archbishop of Lund, who was the foremost adviser to King Valdemar I. In his will Absalon forgives his clerk Saxo a small debt of two and a half marks of silver and tells him to return two borrowed books to the monastery of Sorø. The legacy of Saxo Grammaticus is the sixteen book heroic history of the Danes called Gesta Danorum. In the preface to the work, Saxo writes that his patron Absalon, Archbishop of Lund had encouraged him to write a heroic history of the Danes. The history is thought to have been started about 1185, after Sven Aggesen wrote his history. The goal of Gesta Danorum was as Saxo writes "to glorify our fatherland," which he accomplishes on the model of the Aeneid by Vergil. Saxo also may have owed much to Plato, Cicero and also to more contemporary writers like Geoffrey of Monmouth. Saxo's history of the Danes was compiled from sources that are of questionable historical value but were to him the only ones extant. He drew on oral tales of the Icelanders, ancient volumes, letters carved on rocks and stone, and the statements of his patron Absalon concerning the history of which the Archbishop had been a part. Saxo's work was not strictly a history or a simple record of old tales, rather it was, in the parlance of Friis-Jensen, "a product of Saxo's own mind and times,"; Westergaard writes that Saxo combines the history and mythology of the heroic age of Denmark and reworks it into his own story that exemplifies the past of the Danes. The history is composed of sixteen books and extends from the time of the founders of the Danish people, Dan I of Denmark and Angul into about the year 1187. The first four are concerned with the history of the Danes before Christ, the next four with the history after Christ, books 9-12 Christian Denmark and 13-16 promote Lund and the exploits early before and during Saxo's own lifetime. It is assumed that the last eight books were written first, as Saxo drew heavily on the work of Absalon (who died in 1202, before the work was completed) for evidence of the age of Saint Canute and Valdemar I. The first eight volumes share a likeness with the works of Saxo's contemporary Snorri Sturluson. They deal with mythical elements such as giants and the Scandinavian pantheon of gods. Saxo tells of Dan the first king of Denmark who had a brother named Angul who gave his name to the Angles. He also tells the stories of various other Danish heroes, many who interact with the Scandinavian gods. Saxo's "heathen" gods however were not always good characters. They were sometimes treacherous such as in the story of Harald, legendary king of the Danes, who was taught the ways of warfare by Odinn and then was betrayed and killed by the god who then brought him to Valhalla. Saxo's world is seen to have had very warlike values. He glorifies the heroes that made their names in battle far more than those who made peace. His view of the period of peace under King Frode was very low and was only satisfied when King Knut brought back the ancestral customs. Saxo's chronology of kings extends up to Saint Canute and his son Valdemar I.
Saxo finished the history with the Preface, which he wrote last, about 1216 under the patronage of Anders Sunesen who replaced Absalon as Archbishop of Lund. Saxo included in the preface warm appreciation of both Archbishops and of the reigning King Valdemar II. Of particular interest for Shakespeare scholars is the story of Amleth, the first instance of the playwright's Hamlet. Saxo based the story on an oral tale of a son taking revenge for his murdered father. Christiern Pedersen, a Canon of Lund, collaborated with Jodocus Badius Ascendius, a fellow enthusiast, to print the work of Saxo Grammaticus early in the sixteenth century. This was the first major step toward securing historical significance for Gesta Danorum. It was from that point that it began to spread amongst the academic community. Oliver Elton, who was the first to translate the first nine books of Gesta Danorum into English, wrote that Saxo was the first writer produced by Denmark. Saxo's skill as a Latinist was praised by Erasmus, who wondered at how "a Dane of that age got so great power of eloquence". Later R. W. Chambers would call it "a difficult and bombastic, but always amusing Latin". There have also been several attempts to understand Saxo's style of Latin and place it in history to glean more information about where he may have been educated. Some have considered his Latin to have more in common with legal training than ecclesiastical, and his poetry is thought to have traces of parallelism. He is also seen by modern Danes as their first national historian. His works were received enthusiastically by Renaissance scholars who were curious about pre-Christian history and legends. Saxo's account of history has been seen to differ greatly from that of his contemporaries, especially between his account and those of Norwegians and Icelanders, in that the titles of hero and villain switch between the characters of the various nationalities. There are even differences between Saxo's work and that of fellow Danish historian Sven Aggesen. These differences often are the result of elaboration on the part of Saxo, who used very often euhemerism to explain Scandinavian myth, but also had his own agenda. His account of the tale of Thyri, for example, is far more fantastic than the tale that Sven presents, and for this stylization and elaboration of the facts Saxo's history has often been criticized. Kurt Johannesson's studies expanded greatly the comprehension of the Gesta Danorum, deviating from that common approach - focused mostly in mythology and marked by positivism, and allowing the development of a wider understanding of Saxo's works. Recently, some scholars such as Sigurd Kværndrup, inspired in Johannesson's study of the four Cardinal Virtues in the Gesta Danorum, have studied other elaborations and schemes in Saxo Grammaticus, leading to the conclusion that Saxo, instead of simply distorting a supposed "pure" Scandinavian tradition, was creating something new, attuned to the contest in thirteenth-century Denmark of strengthening institutions and engaging in the Northern Crusades. ^ Westergaard 1952, p. 167. ^ Fisher & Davidson 1980, p. 20. ^ Fisher & Davidson 1980, p. 9-11. ^ Fisher & Davidson 1979, p. 6. ^ Fisher & Davidson 1980, p. 1. ^ a b Fisher & Davidson 1980, p. 10. ^ a b Jones 1968, p. 44. ^ Fisher & Davidson 1979, p. 2-4. ^ Fisher & Davidson 1980, p. 6-9. ^ Friis-Jensen 2006, p. 198. ^ Westergaard 1952, p. 168. ^ Christiansen 1981, p. 383. ^ Dumézil 1973, p. 78-79. ^ Jones 1968, p. 53. ^ Malone 1958, p. 96. ^ Fisher & Davidson 1980, p. 12. ^ Fisher & Davidson 1979, p. 1. ^ Muir 1984, p. 370. ^ a b Fisher & Davidson 1980, p. 3. ^ Amory 1989, p. 702. ^ Fisher & Davidson 1980, p. 2. ^ Muceniecks 2017, p. 53ff. ^ Muceniecks 2017, p. 175. ^ Sawyer 1982, p. 14-16. ^ Muceniecks 2017, p. 67; 175f..
Arthur Remy (1913). "Saxo Grammaticus" . In Herbermann, Charles (ed.). Catholic Encyclopedia. New York: Robert Appleton Company. Chisholm, Hugh, ed. (1911). "Saxo Grammaticus" . Encyclopædia Britannica (11th ed.). Cambridge University Press. Sawyer, P. H. (1982), Kings and Vikings: Scandinavia and Europe AD 700-1100, New York: Methuen & Co.
Wikimedia Commons has media related to Saxo Grammaticus.